Garlic Orzo Tuscan Shrimp is coated in a light and creamy Parmesan cheese sauce filled with garlic, sun dried tomatoes, Baby Bella mushrooms, onion and spinach. 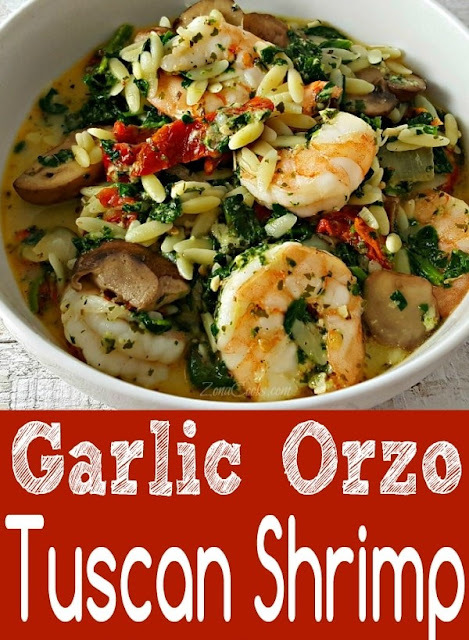 This has really great flavor and the majority of it (other than cooking the orzo) is done in one pan. It is easy and quick, ready in just 20 minutes yet it’s beautiful enough impress a discerning eye. Orzo is a form of short-cut pasta, shaped like a large grain of rice. 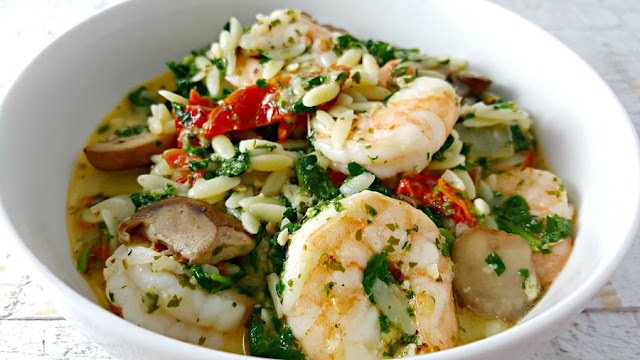 Orzo can be served alone, as a soup accompaniment, as part of a salad, pilaf, or baked in a casserole. Bring a pot of water to a boil and cook the orzo per package instructions, about 8 or 9 minutes. Drain the orzo and set aside. While the orzo is cooking, heat a large skillet over medium heat. Melt the butter and add in the garlic and shrimp and fry two minutes on each side, until cooked through and pink. Transfer the shrimp to a bowl and set aside. Add the onion and mushrooms to the butter remaining in the skillet. Allow them to cook for a couple of minutes. Add the sun dried tomatoes and fry for 1-2 minutes. Reduce heat to medium low heat and add the milk bringing it to a gentle simmer, stirring occasionally. Add salt and pepper to your taste. Add in the spinach leaves and the Parmesan cheese. Allow the sauce to simmer for about a minute until cheese melts. Sprinkle the herbs and parsley over the mix and stir through. Add the shrimp and cooked orzo into the pan. Serve and Enjoy.